Earth Day is not a singular calendar event for us at Schill Grounds Management. True commitment to sustainability and creating a healthier environment for our customers’ communities is a year-round effort. Sustainable means lasting: The approaches we adopt go deeper than providing a solution for today, or appearing “green” so we can all feel better. We are constantly seeking sustainable solutions and working to adapt our processes so they are better for people, the planet and our clients’ profitability. Schill’s commitment to creating a healthier environment encompasses every aspect of our business and reaches every person involved, from the experienced technicians operating our propane mowers to the customers who shop or do business on our clients’ commercial properties. Some might say our goals are lofty. We call them inspired. 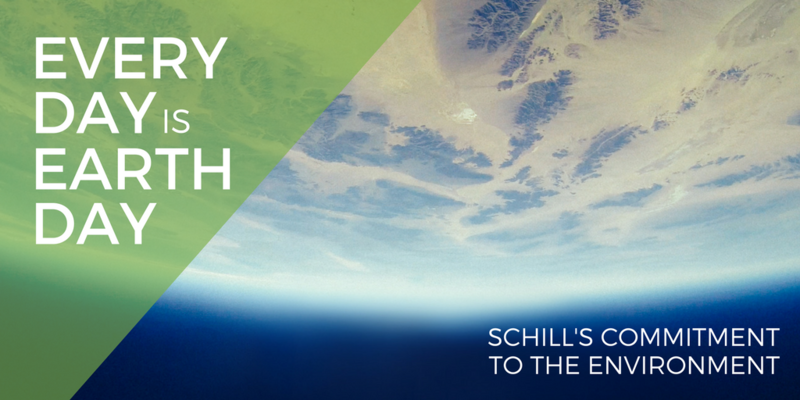 By Earth Day 2015, Schill will eliminate 48,000 pounds of nitrates, 12,000 pounds of phosphates and 45,000 ounces of concentrated pesticides. Also, by that year, 70 percent of our mowing fleet will be powered by propane (40 percent of our mowers already run on this alternative natural energy). So, how will we meet these goals? Let us explain. By 2015, we won’t be gassing up our mowing fleet like most landscape companies. Propane power is produced in Ohio, so it’s locally sourced and creates jobs in our local economy. There are so many aspects of propane that we love. For one, it’s ideal on Ozone Action days because our crews are doing their part to reduce carbon emissions on sweltering Ohio days. Propane burns clean and also contributes to lower equipment maintenance needs, so there are budgetary benefits that can offset the investment in converting our mower fleet. It’s cleaner fuel, plus propane engines run quieter—these are aspects that our customers appreciate. 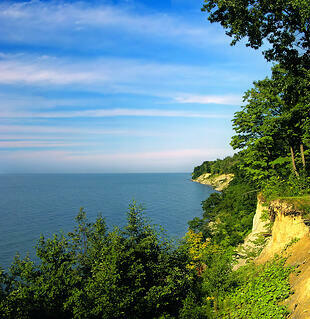 Conserving our clean water supply is critical, and Schill is proud to do its part to prevent harmful chemicals from running off into Lake Erie, which is threatened by phosphates that create toxic algae blooms. We committed to eliminating 12,000 pounds of phosphates, and our hybrid lawn care program makes that possible. Our products are mostly organic. Meanwhile, we focus on ensuring that our clients’ irrigation systems are maintained and monitored for leaks, proper zoning pressure problems, damaged spray heads and other issues that can waste water. Plus, planting water-smart plants in the first place will reduce our dependence on irrigation. You could drink the Holganix 100-percent organic product in our lawn care program (though you probably wouldn’t like it). It’s produced from tea, seaweed and other beneficial bacteria that is healthy for people, our landscapes and the planet. It nourishes the landscape and gives it the nutrients required to grow green and strong. This hybrid program drastically reduces the need for nitrates, phosphates and concentrated pesticides, moving us closer to reaching our sustainability goals. Greening our business, and our clients’ operations, is part of the sustainability commitment. That means providing budget-smart solutions that tread lightly on the environment. 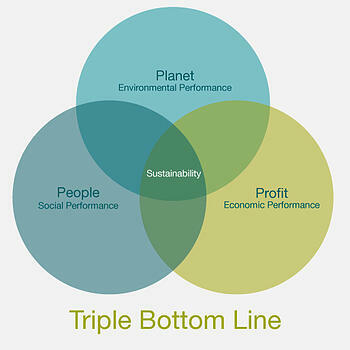 We focus on meeting the demands of our triple bottom line: people, planet and profit. We don’t leave profit out of the mix because, as we said, sustainability means long-term. Decisions that impede our ability to do business successfully are not solutions at all. Sustainability must be practical and accessible. That’s why we focus on an "every day is Earth Day" approach to sustainability. Schill’s C.A.R.E. commitment speaks to Consistency, Accessibility, Reliability and Expertise. This is the promise behind everything we do. Let’s make it Earth Day every day at your company. Let’s talk about how you can contribute to the betterment of the community while also improving your landscape’s health and vitality.